before the longer above Project Summary. The EthoPlasìn holistic education described here is the short term objective of the Pythagorean World Center, while EthoCracy is its long term objective. 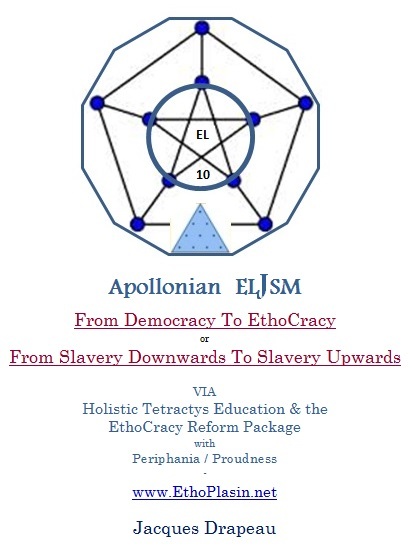 Because of its unique nature, and its foundation on the ELL culture of Ancient-Greece, the special type of Pythagorean Holistic Tetractys Education provided by the PythAcademia deserves a new name and is called "ELLducation". The Return Of Philosophy To Improve Civitas Management - This short opening title, in 8 simple words, could very well be our complete "Mission Statement". Only philosophy, as PhilosophELL, can ensure best possible education; Only best possible education (or: ELLducation) can improve civility and social meritocratic justice; Only improved justice can enhance civic and personal happiness through more impartial politics: these three mounting stepping stones (philosophy, education and justice), form what we call the “Chain Of Best Civitas Management” at the root of the EthoPlasìn Movement. The word 'Civitas' is intended here as the whole body of citizens and institutions, part of the civic environment of a nation, a city, or a community. As for 'Civitas Management', it is intended in terms of managing both persons (for best meritorious education and most ethical behavior) and institutions (for best service and fairest treatment to citizens), but as a whole, persons and institutions harmoniously integrated together, as a unit of expression of the best meaning of what one can call 'Civilization', in a state of Oneness, manifesting a civic environment of best possible Civitas Wellness. The EthoPlasìn Academy is a unique international university offering Holistic Education (or: ELLducation) as opposed to plain instruction. It forms both regular university students, and non-student members, as Civitas Managers, so giving them an additional qualification, over and above any other professional qualification they may have, have acquired, or be acquiring, training them as such, locally or at distance. Its special education (or: ELLducation), and its related discipline, are founded on the exercises, and on the science of being, of the philosophy of Ancient-Greece, combined with 21st century whole brain accelerated learning techniques. Ancient philosophy since Pythagoras, and for some 2000 years after him, was influencing, and ensuring, the propagation of the best possible 'Human Being Education' (Tetractys Education (or: ELLducation): more below on this, in sections 3 and 4), and consequently the best possible quality of Civitas Management of all environments, be they civic, economistic, cultural, political, institutional or ecological. Ancient Philosophy was in fact, first and foremost, the definition of a "System of Values to Help Guide Human Living", that is to guide Civitas Management (persons and institutions together) and, consequently, to help improve all environments, instead of just a "System of Concepts to Help Understand the World", like unfortunately modern and contemporary philosophy have gradually reduced themselves doing in the last 400 years, in particular since 1968; and it was both aspects together, perfectly integrated. In fact, for Ancient-Greece, the second aspect of philosophy (understanding clearly) was inconceivable without the dominant and leading role of the first one (living virtuously), in a state of oneness. The "System of Values", the first aspect, that was the foundation of all good education, and very successfully so, for centuries, is entirely missing today: schools and universities, let alone contemporary philosophy itself, do not 'form', or 'educate' anymore, they only 'instruct' (and not always all that well...) through the acquisition of knowledge. This first aspect, the "System of Values for best Tetractys Education" (or: ELLducation), is exactly what needs to return today, to be spread like a bountiful 'Pythagorean Pollen' [the symbol to the left], in order to help implement best "Human Soul Education" (or: ELLducation), along with, but over and above "Best Brain Education", forming human beings holistically, guiding virtuous human living, and consequently helping to improve all human environments, bringing about the best possible form of Civitas Wellness in the short term, and an eventual world of EthoCracy in the long run. This is the mission of the EthoPlasìn. Oneness - Third, the concept of a Planet Oneness sense of responsibility for all that happens in the world we live in, in particular with regards to our Philoecosophical values, as intended in the Physics part of the inventors of Philosophy, a Philosophy that was, first and foremost, a Science of Being, before it was a Science of Understanding. From the point of view of the above Mission Statement, a fully trained EthoPlasìn member becomes a DEMÔNE (someone pursuing DEcorum, Merit and ONEness). The sense of Planet Oneness Responsibility of the DEMÔNES, from the civic points of view of decorum and merit, is expressed symbolically to the right by the proud Knight figure watching over World Wellness, itself founded on the Pythagorean Spirit. However, we are talking about a DEMÔNE figure in the good philosophical sense of the Ancient Greek word (δαίμων, dáimōn or dæmôn), and not in the bad religious sense of the modern word 'demon'. It means someone with a superior type of knowledge, discipline, skills and conduct, who can therefore play the role of a benevolent mediator between the Human and the Divine realms, that is between the real Platonic world of the Archetypal Ideas and the illusionary world of our daily sensorial reality, for the benefit of all living beings, and, consequently also between the more harmonious and the less harmonious realms of human life, for the improvement in particular of all civic envi ronments. Demône has thus the basic sense of a capable and protective guardian angel and mediator. Their symbolic representations and idols are the Dioskouroi (Sons of God), Castor and Pollux, born of the relation between God and Leda who, as mentioned above, became symbols of Ethics and Justice in the history of the western culture. Two Demônes, uniting formally to help each other, through a relation of love or friendship, swearing their mutual assistance in their EthoPlasìn discipline formation and in their efforts to improve civic environments, form a pair of Dioscures, be it between a man and a woman, two men or two women. These Sacred Dioscurean Unions are strongly encouraged and celebrated by EthoPlasìn. The Demônes and Dioscures are then also united between themselves like solar systems, formed by EthoPlasìn Masters, each with planets and satellites, all collaborating harmoniously to maintain and improve the environment of all living beings, human civic environments in particular, but also philoecosophical environments. The SWAN, as shown to the left, with its elegant modes, its neatness and dignity, not to mention its unique strength in flying assuredly to its target destinations, symbolizes the main EthoPlasìn objective of promoting and achieving best Civic Decorum, most possible Kallos Beauty, and Meritocratic Wellness. 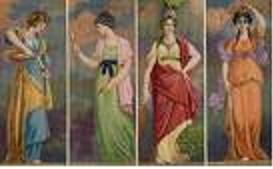 God Apollo, symbol of beauty, harmony, light, purification and harmonious music, at his visits to Delphi, each spring, was brought on a chariot carried by beautiful swans. Zeus (Jupiter), the top level Greek God of the Olympus, transformed himself into a beautiful swan before the fecundation of Leda, leading to the birth of the twins Castor and Pollux, the two handsome Dioscures (Διόσκουροι / Dióskouroi, as "Sons of God") who became Savior symbols, for people or society in difficulty, and symbols of Ethics and Justice in the history of the culture of the Western World. The Swan and the Dioscures are only two of many EthoPlasìn symbols, represented with more beautiful pictures in our page Ways and Symbols. 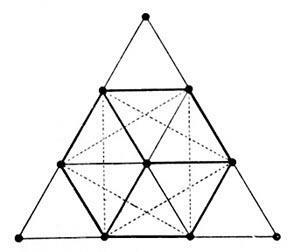 The first of the 5 elements of the Ancient Philosophy, Fire, shown above to the left, is represented in its flat geometrical net view, as the Tetrahedron, with 4 equilateral triangles. The four following sections are also introduced by a representation of the other so-called "Platonic Solids": Air, Earth, Water and Aether. This is part of the Pythagorean Sacred Geometry ** on which you will find additional notes at the bottom of this page. The Nihilistic Mentality Of Today's Social Environment - According to the dominant mentality at the moment, in our Western World, with regards to human or civic conduct, everything is quite permissible, nothing is really bad, and any behavior can always be considered acceptable, or at least justifiable, for a pretended good reason of the 'politically correct'. Nothing really matters and whatever fact or action takes place, as ugly or as bad as it may be, simply forms part of what 'reality' is, without questions needed to be asked. As explained in more details in our Background Page, it is for this reason that our civic world today is dominated by city dwellers who are proactively messy, and arrogantly sloppy, by aggressive bullies and stalkers, by employees and managers of coldly irresponsible conduct towards clients or citizens in general, and by a substantial mass of individuals involved, vagrantly or not, in constant micro-criminality. These categories all share Ethical Relativism, sometimes called more simply Cultural Relativism, even if it is really in fact a full fledge Nihilism, as a common 'philosophy', or way of life, and they all affect the quality of our daily living most negatively. Their 'best' representatives also try to make us believe that nihilism is 'the' modern philosophy of life, that we just have to adapt, be 'modern', and, in advancing their opinion, they are so 'politically correct' that the rest of us feel, most of the time, that we cannot even raise questions about it, let alone criticize it, certainly not in public. More than tolerated however, anything is just plainly 'let go', or ignored, with a strong feeling of complete impotence. Most people, including the politicians elected supposedly to resolve our problems, feeling incapable of taking corrective measures or suggesting solutions, simply accept or tolerate sourly this kind of "Dictatorship of Relativism", living in fright and frustration, at the bottom of their hearts, but with a mild face of politically correct do-gooders on the surface, letting this most disturbing mess go on unattended, and worsening, on a yearly basis. While the last few generations might have made an immense an undeniable progress from a technological point of view, they not only failed to match the same kind of progress from an educational and social point of view, but rather achieved a serious regression, allowing the nihilistic deterioration of all the values that could have prevented the current human disarray and civic disorder; They trashed the traditional Tetractys formation, and consequently they over developed the "Intellectual Center" of the human being while under developing its "Emotional Center", or forgetting completely its development. Even in relation to the "Intellectual Center" they have been grossly incomplete, neglecting for example completely the development of two incredible human powers called Imagination and Memory. All this has caused a serious imbalance in human soul development that is the main cause of most of our problems today. In short, they concentrated on instruction (and not all that well) and forgot education (completely). This is the context that EthoPlasìn wants to correct and improve. 'Education', in practically all contemporary schools after 1968, was reduced to the instruction of the intellectual center of the students (and often not even all that well), forgetting completely the education of their emotional center, causing the serious imbalance in human Tetractys formation that is responsible for most of our social problems today. See also our Background Page for more details. Education, in the best moments of civilization of the last two millennia before 1968, used to be more holistic, (or what we call: ELLducation), and include the formation of the emotional center, through the cultural infusion of a philosophy of ethics which was widely diffused in all good schools, and was generating a related educational discipline based in part on the 4 cardinal virtues (Temperance, Prudence, Fortitude and Justice, as seen in a nice artistic representation to the right) and in part on a strong sense of Beauty applying to both personal achievements and social conduct. These 5 forces were being supported by the sixth element: a responsive Love for all aspects of the created world in a state of oneness. These 6 characteristics, or supporting columns, of the human educational construct, were like the six sides (or the six equilateral triangles) of the perfect 2D Hexagon (or the six sides of the central Hexahedron, or Cube) at the center of the Pythagorean Tetractys (more below) which was the foundation of the formation of the human soul, as wanted by ancient philosophy, as its main purpose, before and over its secondary purpose of helping the understanding of the world. 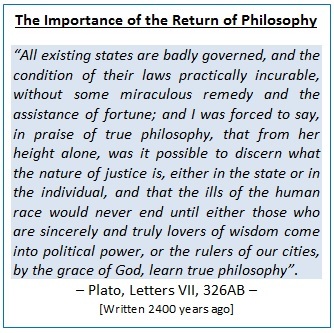 Thus the meaning of "The Return Of Philosophy" (as PhilosophELL) in our Mission Statement above. Thus the EthoPlasìn holistic formation based on the Pythagorean Tetractys. For more details, see our pages on Description In More Details, on Kallos Beauty, on Science Of Being and on the Pythagorean Man Emulation. The EthoPlasìn Reaction With The "Pythagorean Man" - Contrary to the current nihilistic laisser-faire, EthoPlasìn believes there must be a solution to proactively redress this destructive imbalance, and comes forward with a strong corrective initiative through two complementary means: a special International University, PythAcademia (or: EΠAcademia*), and a related worldwide Association, PythAssociation (or: EΠAssociation*). Relativism, or rather Nihilism, is certainly no philosophy of life, not even a 'modern' one. It is in fact, by definition, the absence of any rule, of any principle, of any leading set of values or consistent philosophy of life: the negation of any guiding Philosophy of Life, good or bad. The only way to correct this situation is through proper holistic education (or: ELLducation), that can happen, in an exemplary way, through the combination of a special educational institution and a private membership association, both of World Civic Wellness Vocation. That kind of special education (or: ELLducation), includes, in addition to the normal routine of university instruction, the serious teaching of civic education and the pleasant inculcation of a virtuous discipline, and philosophy of life, leading the conduct of all students and associated members in an emulation of the Pythagorean Man, on the basis of the examples and precedents of the best moments of history of education and civilization: the Pythagorean and Platonic traditions. There is nothing our society, or the whole world, needs more today. It is quite obvious, to anyone with common sense, that the solution to most of our 'modern problems' stems precisely from such reform where, in particular, schools will finally get back to provide real Education (or: ELLducation as opposed to the plain Instruction provided today), like they did quite well for the better parts of many centuries, before the 1968 nihilistic revolution came about, in a catastrophic way, with its roots in the Faustian Renaissance, to bring down all traditional values, without even attempting first to improve them, or to substitute them with better ones. This is where the EthoPlasìn project comes in to help, with its small but meaningful contribution. This new kind of real holistic education (or: ELLducation), if well implemented, will soon spread to, and influence, the political class, "correcting the politically correct" accordingly, lead to affirmative policies like some of the ones mentioned in our pages on Lobbying and Hot Issues in relation to Family, Immigration, Governments, Politicians etc., and promote the propagation of more Meritocracy, possibly even the advent of EthoCracy, in the world in general. The EthoPlasìn full graphical public Academy Symbol is shown to the right. The Greek capital "P" in the middle of EthoΠlasìn, symbolizes the noble 'door' through which members enter the new world of Civic Wellness (social ethics, philosophical virtues and philoecosophical values) that, as members of the PythAcademia and PythAssociation, they become devoted to acquire promote and defend. EthoPlasìn is pronounced with the accent on the final syllable, thus it accented "ì" . The private Member Symbol (the gold insignia at the top of this page, and also shown in a bigger and clearer version at the bottom of our page on Ways and Symbols), is the symbol worn at all times, in a visible way, by all members, in at least one of its 6 forms (necklace, bracelet, ring, belt, pin or emblem). Its bottom part represents the 10 steps or grades of the EthoPlasìn Rules of discipline. The 4 Doric columns of Polykleitonian proportions represent the Pythagorean Tetractys (explained in our page on the Pythagorean Man Emulation) and the 4 basic Cardinal Virtues to be pursued by members, who themselves are like strong and beautiful columns supporting the construction of World Civic Wellness. 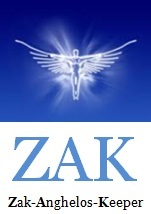 In that symbol, the Greek 'th' letter, "Θ", appearing at the roof base level to the right, is the symbol of Ethics. The Greek 'P' letter, "Π", is the symbol of the noble 'door' to access higher knowledge and virtues, and is associated with the "6P Approach" used by members in facing life issues, as explained in our page "Description in more details". The 3 spaces between the Doric columns show an ancient Greek "E" shape on the left side, an ancient Greek "P" shape (Π) as the 'door' of the central area, and an ancient Greek "A" shape on the right, meaning "EPA" (in English), or "EΠA" (in Greek), as the initials of the EthoPlasìn Academy's full name. The various geometrical shapes of the symbol all have their symbolic meanings, including the Circle at the top representing the high ideal of (civic) 'perfection' pursued by all members. Its overall shape is an Hexagon (like the public symbol to the right, and like the three main residential buildings on the campus, as shown in an Attachment, with one of the "6P Philosophers" sculptured on each side), representing the Strength of the discipline. The two sides of the central Rectangle holding the 4 Doric columns are built on the basis of the proportions of the Golden Number, usually represented today by the Greek letter 'phi' (Φ) of 'Philosophy', appearing at the roof base level to the left, and representing the Beauty and the Justice brought in society by the life style of fully trained members (as explained in our pages on Membership Entry Rules and Kallos Beauty). Holistic Education (or: ELLducation), Leading To Civitas Wellness - Today's schools, and universities in particular, only have the dry instructional role that the dominant 'culture' of nihilism has reduced them having, and no more a real loving educational role like the one they have had during the best periods of civilization of the last two millennia. Our society today needs the resumption of such a loving educational role on the part of more schools, the only type of real holistic education (or: ELLducation), that can bring back the DEMÔNE values (better decorum, more meritocracy and a sense of planet oneness responsibility) on the part of as many persons as possible. It is with this dire need in mind, and as a constructive reaction to the negative Background of nihilism mentioned above, along with the desire to substitute the Faustian Man with the Pythagorean Man, that the EthoPlasìn Academy was conceived as a new and unique type of International University of World Civic Wellness Vocation. The Academy is a Charter School and has a explicit mandate from its Charter and Foundation to specifically "Educate" its students, as opposed to simply, and only implicitly, "Instruct" them, like it is the case with all other modern universities. The Pythagorean World Center under which it falls is a 'no-profit' organization and the PythAcademia itself is even a 'no-fee' institution for its well pre-selected students. The mandate to the Academy is to educate its students as good human beings, and as good citizens, while also forming them normally as good professionals at university level. 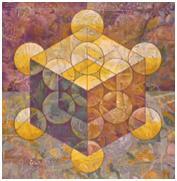 The Tetractys of the holistic human formation is shown to the right. For more details see our page on the "Pythagorean Man". The Quaternion (4 levels) represent Body, Soul, Spirit and Wisdom. The six sides of the central 2D Hexagon, or its six equilateral 2D triangles, as mentioned above, were associated to the four Cardinal Virtues (Temperance, Prudence, Fortitude and Justice), plus Beauty and Love. These six supporting forces at the base of all human holistic formation were lived in a state of Grateful Compassion for the created world, the 7th force of the holistic formation, represented by the sphere surrounding the overall Tetractys (not shown here). 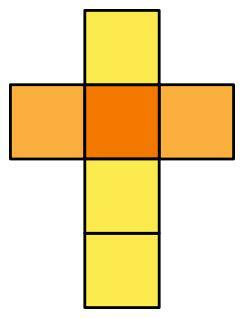 To be noted: with proper observation, one can see that the 2D Hexagon in the central part of the Tetractys is in fact the flat reflection of a 3D Cube, or an Hexahedron. 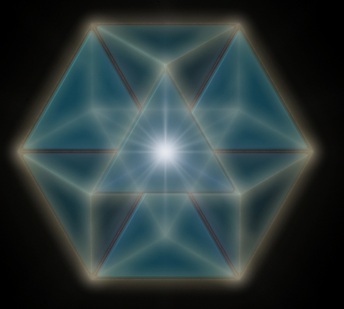 The 3D Hexahedron, or Cube, and its corresponding 2D Hexagon, in the Sacred Pythagorean Geometry**, and also in the geometry of the Platonic Perfect Solids, represent Earth, as the place where the holistic formation of the human Tetractys has to be implemented for the benefit of humanity and all living beings, with the related improvement of all environments; thus their central symbolic meaning in the EthoPlasìn Project, and the representation of the cube, in flat geometrical net view, at the top left corner of this third section called "The Project"; thus the hexagonal architectural shape of some of the buildings of the campus and the hexagonal shape of the main public EthoPlasìn logo shown at the bottom of the previous section. A Selective Admission With Full Scholarship - Admission at the Academy is very selective but, once accepted and committed to its discipline, all students are educated on full scholarship, as 'no-fee' students, with full and free room and board, including full uniform clothing. For this reason, students are considered "Guests" of the Arium, admitted under the full authority of the BeLovArium Foundation for as long as they respect its rules and discipline and for as long as the foundation considers their presence desirable at the Academy, or at other universities as extern members of the Academy. The "price" to pay for all these free services is in terms of respecting a strong internal discipline and in providing the equivalent of about 8 hours per week to help the Arium in various ways, like growing their own vegetarian food, and assisting campus animals and people victims of civic violence hosted temporarily in the CivicArium of the campus. In terms of money, students at the Academy are only required to provide for the little pocket money they may need when going out of the Arium, and there are even ways and occasions to earn such pocket money in collaborating to various aspects of the campus, both on the private studying side, closed to the public, and on the two Commercial and Public Entertainment areas, that are open to the public (The formal ApolafsArium and the casual DiaskedArium). Forming the Adonis and Venus of civic life is the EthoPlasìn mission (Antonio Canova, neoclassical sculpture of Adonis and Venus, around 1800. 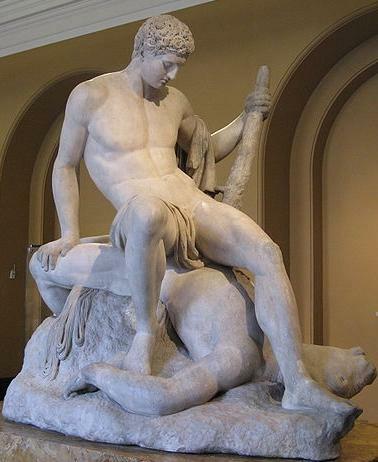 Canova was nicknamed Phidias after the famous Classical Greece sculptor who lived around ~BC 450). The Resurrection of Adonis each year symbolizes the rebirth of beautiful Earth each spring, placing it in the best possible hands (as shown in the lower part of the first section) for regeneration purposes, in a new effort to promote Kallos Beauty in all environments, including in particular civic environments. A Pythagorean Philosophy Of Life - Before it is a University however, EthoPlasìn is first a Science of Being or a Philosophy of Life based on the Pythagorean Man Emulation. Its Academy wants to be Modern in conception but, at the same time, provide an education firmly rooted in the type of education that used to be provided by Ancient Greek Philosophers (or: ELLducation), using the best of both worlds: a kind of Modern Platonic 'Academia' of clear Pythagorean descent, thus its short name: "PythAcademia" (or: EΠAcademia*). The Academy wants to provide a holistic personal formation and in particular a harmonious civic life-style discipline. While undoubtedly forming good professionals normally at university level, the Academy wants first and foremost to form better human beings, better citizens and better inhabitants of Planet Earth. Through them, it wants to improve in particular the civic environments where they will live after graduation, including their philoecosophical and pro-meritocracy aspects. In addition to being a school at University level, EthoPlasìn is also a private Foundation, a ThinkTank, an Academy and an Association: all these components of the Pythagorean World Center collaborate to provide a new kind of holistic formation, and to promote the related discipline and philosophy around the world. The short name of its Association is: PythAssociation, while the short name of the university proper is PythAcademia through which the campus is mainly known to the public at large around the world. Members freely impose the Academy's discipline upon themselves and engage promoting it through discretely being good examples of it. With its special ELLducation, EthoPlasìn also contributes in the end to the general improvement of all Educational standards around the world, as opposed to the 'only-instructional' standards that are used at the moment by most, if not all, modern schools and universities worldwide. Down the line, it contributes to the improvement of all environments: professional, cultural, political, institutional, civic, economistic, meritocratic and philoecosophical, longing for an eventual EthoCratic world. The TEUC Cyber Club Of The Academy And Its Association - The PythAcademia forms students intensively locally on its ARIUM campus; In turn, the PythAssociation forms members at distance while they study or work in their own countries, and it links all of them through a private and powerful EthoPlasìn Cyber Club: in fact, in addition to having, to start with, a kind of traditional type of university on the EthoPlasìn campus, the PythAcademia and the PythAssociation collaborate between themselves, and with other universities around the world, to also offer best supplementary Telematic University teaching to all members, for the purposes of both its Faculty Instruction and its special Holistic Education (or: ELLducation), and discipline. From this point of view, the Physical EthoPlasìn Campus is supplemented, and extended worldwide, by an additional virtual campus, called the TEUC (Telematic EthoPlasìn University Campus), and this virtual campus is controlled, and tested, by the physical campus located in the historical geographical area (in Greece, south of Athens) at the source of the EthoPlasìn Philosophy and Science Of Being. The 'Victory On The Minotaur' And The 'Civitas Qualifications' - These two elements combined, constitute the fundamental difference between the EthoPlasìn and all other contemporary universities. They are also, both, requirements in addition to a regular curriculum of normal university study. THE FIRST ELEMENT of difference is the so-called "Victory on the Minotaur" through the development of an equilibrated Pythagorean Tetractys of its students, over and above the normal development of their intellectual center leading to the acquisition of professional qualifications, which is what other universities limit themselves doing. This first element of difference is acquired in many ways and in various stages. The EthoPlasìn, as a First Stage, 'steals' one full year of the life of its students, as their EPY (EthoPlasìn Propaedeutic Year), for test and reciprocal evaluation purposes, usually at age 18, or just after their PPS, between the end of their pre-university schooling and the beginning of their university proper. During that dedicated EPY year, as fulltime interns, the PythAcademia initiates them, and trains them, in its special Pythagorean Tetractys formation, imposing them a discipline that leads to a better knowledge and control of their passions and emotions or, in other words, to the "Victory On The Minotaur". As explained also more extensively in our page on Description In More Details, the EthoPlasìn does not form only the Intellectual Center of its students, like all contemporary universities limit themselves doing, but also in particular their Emotional Center, along with the equilibrated development of their best physical and artistic aptitudes: it provides them with Real Holistic Education, (or: ELLducation), as opposed to just Instruction. It does so under full scholarship, preparing them for better university studies, and for a better role in civic life, through their holistic formation based on a strong sense of excellence, decorum, merit, cardinal virtues, philoecosophical values and planet oneness responsibility. In an EthoCracy, this year of preparation, the EPY, can be combined to a special version of the PPS (Patriotic Paramilitary Service) done from within the Academy. Then, as a Second Stage, at the end of that dedicated propaedeutic year, the better students get chosen to proceed with their university study in various ways, with scholarship assistance, while keeping on, at the same time, with the acquisition of their EthoPlasìn Discipline formation at higher levels. THE SECOND ELEMENT of difference, the acquisition of Civitas Qualifications, is explained briefly in the second paragraph after the following notes; of course, the two stages mentioned above, in relation to the first element, apply also to this second element, mutatis mutandis. The "Victory on the Minotaur" shown to the right. (as well represented by the beautiful sculpture of Antonio Canova, completed in 1782, and now the property of the Victoria and Albert Museum in London). Theseus exterminates the minotaur of the uncontrolled human passions (a monster represented with the body of a man, and the head of a bull in this case) and, by the same self-mastering operation, finds the rope (running clearly and symbolically from under the dead minotaur, and passing under the right foot of Theseus on the sculpture, indicating the 'right' direction) that will lead him out of the labyrinth, or out of the Platonic Cavern, that is out to the Apollonian Light of the best possible type of personal and civic life. The "Difference" between the EthoPlasìn PythAcademia and other universities, as a first element of formation, is thus the 'Victory on the Minotaur' that students have to achieve, mastering their passions, and following the rope of the gradual formation of their Pythagorean Tetractys, being led to the Apollonian Light of the acquisition of philosophical Wisdom, once out of the Platonic Cave, while preparing themselves as top professionals. This victory however, to complete "The Difference", must be combined with the second element of formation, also unique to EthoPlasìn, which is the acquisition of "Civitas Qualifications", as explained briefly in the second following paragraph. 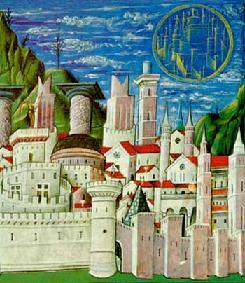 Further down to the left, a symbolic view of ideal Civitas Management as promoted by EthoPlasìn, in the double view of a terrestrial city and its celestial model painted by Niccolo Polano in 1460: Civitas Terrena et Civitas Caelestis. Interns And Externs - At this second stage, after the EPY, a first group is admitted to proceed with university study at the PythAcademia itself, still under full scholarship but, of course, only if the students involved are interested in the few full EthoPlasìn University Faculties available at the Academy. A second group is allowed to do so at other universities of their choice and, if there is a bilateral EthoPlasìn agreement with the chosen university, under full scholarship, including lodging and uniform clothing. A third group is allowed to do so at other universities with no bilateral agreement but only under partial scholarship. All those continuing with full or partial assistance have to wear the EthoPlasìn uniform, similar to what some military students do when frequenting various universities, and abide strictly by its prestige, decorum and discipline. A forth group has to leave the Academy with no further scholarship assistance but with still some occasional privileges, as members, when visiting, or collaborating with, the PythagorArium. A fifth group of course has to leave without any further financial assistance from the Academy because they are clearly incapable of following its full discipline. Some of this last group are nevertheless allowed to maintain membership in the EthoPlasìn Association, with still occasional minor privileges, while others get rejected outright, and denied membership, because of incorrect behavior or obvious incapacity to comply with all the basic requirements. All this is part of their formal contractual agreement signed when joining the Academy at the beginning of the first stage of propaedeutic evaluation, during the EPY. Because of the very strict pre-selection screening process before Admission time, the rejected students are usually rather few at the end of any given year. The big majority will have wisely invested a year of their life, the EPY, to harvest a prestigious holistic education, even fully free in most cases, that should help them jump more easily into the best employment opportunities, and hopefully influence the improvement of all civic environments around the world. All EthoPlasìn Members Have To Acquire Civitas Qualifications - This requirement applies to both students, Interns or Externs, and non-student members. This is THE SECOND ELEMENT of "The Difference". In fact, both the "Victory On The Minotaur" (the first element), and the related Acquisition of Civitas Management Qualifications (the second element), apply to all members, subject to loosing membership. The first common year of propaedeutic formation, the EPY, usually starting at age 18, completes the Civitas Initiation level with the title of Civitas Technician at age 19. The following three years consist in a Civitas Apprenticeship leading to the title of Civit as Professional at age 22. The following two years lead to becoming a Civitas Manager at age 24. This is where most members will stop their Civitas Training. However, with two more years of internal training, a student can become a Civitas Administrator at age 26. Finally, a Civitas Administrator can become a Civitas Master at age 28, the maximum level, after ten years of intensive Civitas Training. The Interns admitted to the faculty of Civitas Administration at the Arium, and in consideration of their privileged internal training, can, and should normally, become Civitas Administrators after only five years instead of seven, at age 24 and possibly complete a Civitas Mastership at age 26. In any case, with two more years, all Civitas Administrators can become Civitas Masters, either at age 26 or at age 28. Externs can only become Civitas Administrators at age 26, after returning at the Arium as Interns if necessary, for one or two years, after the completion of their study at other universities. The alternative is for them to stay Civitas Managers while starting their normal professional life in their chosen field of activity outside the Arium. All these Civitas Qualifications are always on top of, and in addition to, a regular curriculum of normal university study. The approximately ten years involved to reach a Civitas Mastership are also closely related to the Ten Rules and Grades of the EthoPlasìn discipline. A Student has to reach and maintain at least a minimum level of Civitas Manager, after five years of formation as a student. A Member (non-student) has to maintain a minimum title of Civitas Professional after three years of training, at or outside the Arium. These minimum levels are required in order to be able to maintain membership. Civitas Managers, Administrators and Masters are also often called generically "EthoCratic Leaders" in honor of their extensive EthoPlasìn formation and the expectation they could eventually play a major leading role in a new world of EthoCracy. For the privileged long-term students at the Arium, the type of formation received in the EPY (the first year of propaedeutic initiation) is replaced and/or supplemented in the following years mainly by the so-called "PythagorArium Hour" (or PytHour), that is the first studying hour of the schedule of each day at the Academy, discussing various elements of discipline, and complying to additional disciplinary exercises. This intensive internal training explains why Interns can often become Civitas Masters at age 26 instead of at age 28. All this is explained in more details in our page Description In More Details. Hopefully, this holistic formation will also involve the will to maintain a proud life-long membership to the EthoPlasìn Association on the part of all members. Financing - Financing is also completely different from all other universities and rather unique in nature. It becomes a kind of THIRD ELEMENT to "The Difference", albeit maybe a secondary one. The intensity of the dual-training of the EthoPlasìn students requires them to be psychologically free from any kind of financial preoccupation. On the part of the EthoPlasìn, providing full scholarship to all students at the Academy ensures its complete freedom of action for the purposes of both admission and dismissal of its students at any given time. The PythAcademia is in fact a no-fee auto-financed university, or a full-scholarship university, for all its students. The BeLovArium Foundation of the Pythagorean World Center finances the long-term real-estate part of the overall project. In turn, the full scholarships, and the routine operational expenses for all students at the Arium, and for part of the EthoPlasìn students at other universities, are completely auto-financed by the revenues of the two important Entertainment Centers of the ARIUM open to the public, on a competitive commercial basis, on the Mediterranean seaside: the smaller and more formal Enjoyment Center (the ApolafsArium), and the bigger and more casual Amusement Center (the DiaskedArium). A brief description of these 3 financing components (BeLovArium, ApolafsArium and DiaskedArium) is given in the Campus Components section, further down on this page. As seen above, the first common year of propaedeutic formation mentioned above, the EPY, also called the year of "Civitas Initiation", fully dedicated to the EthoPlasìn discipline, based on the Pythagorean Human Tetractys, is symbolized by the Myth of Theseus And the Minotaur. In turn, the success of the comprehensive formation, leading to the years of "Civitas Mastership", when members finally get their "Civitas Master" title (in addition to their regular university degree), is symbolized by the crown of gold laurels, a history-long symbol of Human Excellence (example shown to the right). An eventual critical mass of 'Civitas Managers' and 'Civitas Professionals' is expected to influence the advent of at least more Meritocracy in the short term, and an eventual world of EthoCracy as a long term objective. The Worldwide Improvement Of Personal, Family And Civic Life - In short, the main EthoPlasìn objective is to form members who, while being highly qualified workers or professionals, and after having received a special human formation on the basis of the Pythagorean Tetractys and Platonic Philosophy in Ethics, Aesthetics and Politics, will also want, and be able, at the same time, to pursue the spreading of better Decorum, more Meritocracy and the improvement of all Civic and Philoecosophical environments around the world. It is essentially an objective of Beauty: personal beauty, civic beauty and overall Kallos Beauty in all aspects of life. To achieve this objective, Students who will have graduated at the PythAcademia, or elsewhere under its scholarship, will always be limited in number but, Members at large, trained at distance by the PythAssociation, can quickly become thousands, if not millions, with the two categories contributing, all together, each their own way, to this important objective for the new generations of the third millennium. These together, students and members, may be able to build the "Critical Mass" necessary to spark the development of a new EthoCracy, or at least certainly a better Meritocracy, based on the DEMÔNE values (Better Decorum, More Merit and Oneness Responsibility at Planet Earth Level). The nature of that "Critical Mass" will be essentially one of "BeLovArium" (the name of the foundation behind the Academy, the body that formulated the Ten Grades of the EthoPlasìn Discipline), creating a critical space, or "Arium", filled with the "Belief" in the above objectives and the "Love" of each member for oneself, the humanity, the planet Earth and the Universe, in pursuing these same objectives. Seen from another point of view, the increase of this "Critical Mass" will be built and weighted in terms of a growing number of Pythagorean Man type of individuals in our society, and a corresponding diminishing number of the "Faustian Man" types, from a civic and ethical points of view. 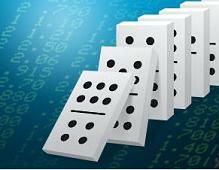 The Critical Mass And The Domino Effect - In addition, the Good Example and success of the EthoPlasìn Academy, with the force of the Critical Mass of its members around the world, is expected to have a inevitable and significant Domino Effect on a growing number of schools in a growing number of countries. These other institutions might not adopt a discipline as strict as the EthoPlasìn, but nevertheless start to integrate to their programs important elements of civic, meritocratic and philoecosophical education and discipline that have been completely ignored or grossly neglected in the last half century in particular, gradually pushing, along with the EthoPlasìn students and members, in the direction of the final objective of improving all environments around the world, let alone the advent of a possible new world of EthoCracy. Both a Domino Effect and a Chain Reaction of incredibly powerful and positive cascading improvements on all aspects of our environments will be put into motion by the realization of the EthoPlasìn project. Families - If the environments in general start to improve and become more receptive to the requirements of real holistic education, let alone the schools themselves, families in turn will also have an easier role in understanding, pursuing, or at least backing up passively, these same objectives at home with their children; Good Civic Education will gradually return, finally, to be again "politically correct". Society - If both schools and families improve their education, and the environments return to request it as "politically correct", the overall society will quickly make gigantic progress in improving proportionately all aspects of the daily civic life of all of us. This is the meaning of the Pythagorean World Wellness and the related EthoPlasìn Civic Vocation and Mission. The Force and Beauty of the "Pythagorean Man"
- The spreading of PhiloEcoSophical Oneness for the benefit of all living beings, and best Civitas Management of all citizens, institutions and environments. The six sections here above have defined the various aspects of the EthoPlasìn Mission. The Pythagorean World Center will pursue that mission by pushing for Excellence in all aspects of the life of its members, in particular in relation to their Civic Behavior, and by promoting the phasing-in of progressively higher degrees of Decorum, Merit, Oneness Responsibility, Ethics, Kallos Beauty and Philoecosophical Values in our society, with each new generation to come. 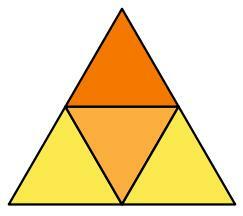 Such personal pursuit, in the early tradition, was called being a "Pythagorean Man". In the later tradition of Plato, it was called being a "Responsive Virtuous Counselor" (Αγαθος συμβουλος). In our contemporary world, it could be called being an "EthoPlasìn Member", or simply "Being EthoPlasìn" . Be it clear however that this "mission" will never be in terms of attempting to change the world, at least not directly or forcefully. This would transform a philosophical mission into an ideological one, which is totally excluded from the EthoPlasìn culture. It will never be in terms of trying to push, or to force, people to change their behavior. It will always, and only, be in terms of attracting, like a magnet, or inviting, people to get better Pythagorean Education, (or: ELLducation), in terms of reflexively promoting the related values, and in terms of members of its association giving the best examples of them, in an attractive emulation process for those seeing them, as enthusiastic champions of these values, in their own lives, as much as possible, in all circumstances. EthoPlasìn members believe the main way to improve the world, or to improve others, is to discretely improve oneself and consequently put many others in a situation of desire of emulation. This is the meaning of the famous saying of Ancient-Greece philosophy, "Know Thyself", as the only source of knowledge for any possible level of human perfection, and consequently the source of the wisdom that is the only possible path to human happiness on Planet Earth. Trying forcefully, or even only proactively, to improve others, is the best way to deteriorate oneself, let alone the others. Consequently, EthoPlasìn does not try to change society, or the world, through the global applications of more or less unconscious social policies, but rather to give citizens the best tools to know and improve themselves, as individual persons, through the conscious self-imposition of a philosophical discipline of merit and ethics. Members do not loose time with those who are simply happy complaining about others, and unhappy thinking about themselves. At best, members give them good example, and gentle indications about the right path, while they keep escalating the ladder of Pythagorean self-improvement, in isolation if necessary. Isolation however is only temporary as, through good example, many others will eventually convince themselves to undertake the escalation and, up there, they will also find the pleasant company of many other joyful persons who have already reached an upper floor, through the same or a variety of similar ladders, at a superior level offering new friends, better opportunities and greater love. This "Critical Mass" however will eventually, and inevitably, have positive cascading effects for the construction of a better world environment. This is the "Civitas Wellness Vocation" of the EthoPlasìn. This is "Being EthoPlasìn", and longing for EthoCracy. - "There is no other life one should live than the one which will clearly turn out to be advantageous to the world". - "Doing what is unjust is more to be guarded against than suffering it, and it is not seeming to be good, but being good, that a man should take care of, more than anything else, both in his public and his private life". - "The second best thing, after being just, is to become just by being disciplined and paying one's due". - "Every form of flattery, both the form concerned with oneself and that concerned with others, whether they are few or many, is to be avoided". - "Oratory, and every other activity, is always to be used in support of what is just". - "Then, as a philosopher, let someone despise you as a fool, and throw dirt on you, even confidently let him deal you that demeaning blow. Nothing terrible will happen to you if you really are an admirable and good man, one who practices excellence; then, after you have practiced it, if you think you should, turn to politics. 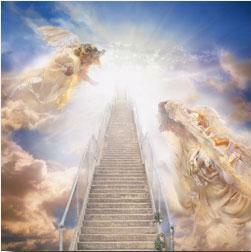 [...] This way of life is the best, to practice justice and the rest of excellence, both in life and in death". - The above quotes from Plato's Gorgias are well summarized by what Plato said in his other work, Politeia, better known as Republic: "The Philosopher, by consorting with what is ordered and divine, and despite all the slanders around, that say otherwise, himself becomes as divine and ordered as a human being can". Whether we pray or not, give us what is good for us. What is bad for us, give us not, however hard we pray for it. Distant recruits sailing to join the Blue EthoPlasìn Realm of Pythagorean World Civic Wellness, dreaming, as per the words of Lennon's song, that if they reach their objective, "...the World Will Be As One". Contrary to what might have been Lennon's intent however, let it be "As One" like a beautiful mosaic of different nations, each with their well preserved cultures, not like a nihilistic global melting pot, but nevertheless "As One" in terms of being all led by the fundamental principles of a holistic form of EthoPlasìn education,(or rather: ELLducation), and by an EthoCracy form of government, hopefully also communicating better and more easily between all of us at world level through EthoSpeak, as the easiest universal auxiliary language, while dedicating more time deepening the perfection of each our own beautiful national languages. This website is already accused, by many, of being the beautiful utopia of a dreamer. Admittedly it defines a high objective that is difficult to reach, and all but 'politically correct' in the present context of rampaging nihilism. For the author, these arguments are only good reasons to better justify its need. Its existence, even at this early virtual stage, will mainly disturb those who already gave up, or even maybe enjoy the present civic muddle; It will however, most probably, also encourage those who still have hope for a civic revival, and for the advent of a new era of better social meritocratic justice and wellness, inviting them to take participative action or, as an alternative, or in a supplementary way, invent themselves other useful initiatives that might be more realistic from their point of view. In both cases the EthoPlasìn project will have had its meaningful utility, let alone the joy its development will have brought to its developer, dreamer or not. "Always hope, as no situation is so bad as to ever be without hope"
Once admitted at the Academy, after tough selection, students study free of any expense, on full sc holarship, including full uniform clothing. In fact this no-fee policy applies to all students and members present at the campus. For this reason, the Pythagorean needs good sources of funds to finance the project. As described below, it has 3 financing source components, but operating overall all together on a no-profit basis. From an educational point of view it has 8 more components described after the financing ones. Finally, it has a main umbrella container, for a total of 12 major components. It has however also various other minor components described after the educational ones. The overall body covering all the various components of the campus is the PythagorArium (its short name), or the Pythagorean World Center (its official long name). The PythagorArium website is mostly private, reserved to members, but this EthoPlasìn website can give you a good idea, here below, of all the components of the PythagorArium. The page links indicated in the tree-structure, under the description of the components, will provide more detailed descriptions of the various aspects of the PythagorArium. Here is first a brief description of the 12 PythagorArium components. BeLovArium - This is the Foundation behind the PythagorArium. 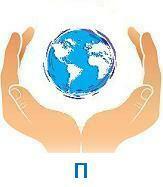 BeLovArium acts as the main financial authority for the overall project, but on a no-profit basis. The Foundation provides only the essential initial and long term real estate financing for the overall project and its eventual structural maintenance and expansion. To assist itself for current expenses to be paid on a self-financing basis, BeLovArium operates two commercial recreational centers. As seen below, the first one (ApolafsArium) is a smaller one, attached to the Academy, and with a rather formal environment for the entertainment of well dressed people and the training of the EthoPlasìn students in various aspects of social decorum. The second one is a bigger one (DiaskedArium), detached from the Academy, a few kilometers more to the south, and with a normal casual environment for the public at large. 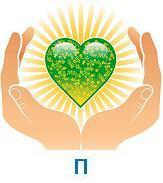 BeLovArium has three elements in its name: Belief, Love and Arium. The first element is indicated by the initial 'Be' of the name, meaning 'Belief', but intended strictly in a philosophical mental way, and not in any religious way. The second element is 'Love', but also intended in its real philosophical platonic way. The third element, 'Arium', means a dedicated living area associated with a specified function, as a place where interested people live, gather and take care of that function. Thus the full name of the Foundation: BeLovArium. From this point of view, EthoPlasìn is an Academy and International University that provides a holistic education (or: ELLducation), founded on Belief and Love intended in their Ancient-Greece philosophical sense, through a unique formation process called the Pythagorean Man Emulation. This formation is done through a special discipline for the best performance of the Pythagorean Tetractys, and consequently the acquisition of Civitas Qualifications and Philosophical Wisdom, put at the service of the... Arium, that is put at the service of civic environments where people live. ApolafsArium - The ApolafsArium is the small Public Entertainment Compound, as the "Enjoyment Compound", attached directly to the Campus. It is a rather formal entertainment area open only to people with proper city clothing (the following paragraph will talk about a similar entertainment area, the DiaskedArium, much bigger in size and open to people with casual clothing). Men can only come in with jacket, tie and long trousers; Women with only dresses or skirts and no trousers. No jeans allowed. At these conditions, and on a booking basis, this semi-private area is open to the general public for entertainment through cultural and recreational activities, including limited pool and sea swimming. The ApolafsArium also serves as a training area for the EthoPlasìn students in various aspects of etiquette, protocol and social decorum. EthoPlasìn students for example regularly serve as formal waiters, dressing tables and serving food elegantly with white gloves added to their regular full uniform. Many of them also often give short recitals of their music or singing talents in front of clients. Otherwise the music of ambiance is of the light harmonic classical type, or beautiful arias of opera. The food served is strictly vegetarian albeit of the best level and quality produced biologically on the campus. The word 'Apolafsy' ("απόλαυση"), means something like 'Pure enjoyment, of both body and soul together' through recreation or various other joyful and rewarding activities. Because of the difficulty of its Greek-root name, members of the public sometimes call it the "EnjoymentArium". The ApolafsArium also includes the AgorArium with two stores, a small one on the private studying side and two more important ones on the public recreational side where its honey, its plants and its symbol stones can be acquired as souvenirs or gifts of good wishes. It also includes a small ThalasArium with SPA, swimming pools and limited sea gym entertainment activities. It has its own small HotelArium (matching more formally the casual HostelArium of the following DiaskedArium) and RefectArium (matching again more formally the casual CafetArium of the following DiaskedArium). Finally there are two important components that serve to expose to the public the talent of its students and members. There is first the ArenArium that serves in particular as the arena for demonstrations and training in EthoJudo, but also for various kinds of other shows where students can expose their skills, talents and life style to the public. Then there is the MusicArium that does the same thing specifically for classical music talent and choir recitals. These regular shows are in fact an important attraction factor for the public at large to come to the ApolafsArium instead of to the DiaskedArium for entertainment purposes as they can be combined, either free or for a minimal additional charge, to typical visits of clients coming in for elegant dining or other entertainment of essentially a good cultural nature. The ArenArium also serves to bring in a wide public at the occasion of the annual graduation ceremony, and the grand dancing ball following it, on an invitation or a booking basis. See the Attachments section below for an outline of the Campus and focus on the left part of the plan which is the Public side. 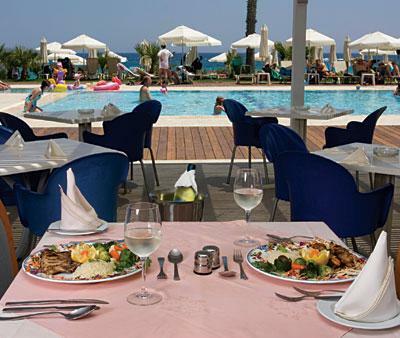 Café-Restaurant around a pool, with a view on the sea. This is the typical kind of attraction offered on the public side of the Campus which is meant to be a tool of self-financing of the Academy in the long run for its current expenses. The two recreational and entertainment sites open to the public, the formal ApolafsArium and the casual DiaskedArium, separated by a few kilometers of coastline, are united by both water (a circuit of sportive canoes and other paddle or sail boats) and by land (a private circuit of electrical mini-bus service) to help clients move easily between one and the other. DiaskedArium - The DiaskedArium is the second public entertainment or "Recreational Compound", as the "Amusement Compound" this time, detached a few kilometers from the campus. Because of the difficulty of its Greek-root name, it is often called more simply the AmusementArium. It is similar to the "Enjoyment Compound", but much bigger in size and, this time, in a non formal environment. In fact, it has a completely casual environment open to the general public for sophisticated recreational activities without preoccupation at the entrance for the way they dress. Thus the name DiaskedArium, as 'Diaskedasi' ("διασκέδαση") means amusement, or plain fun, as opposed to 'Enjoyment' like in the case of the ApolafsArium mentioned in the previous paragraph. The DiaskedArium however includes all the same sub-components of the ApolafsArium, like the HostelArium, the CafetArium and the ThalasArium SPA, but in a completely informal environment and in a larger scale. In fact, the DiaskedArium is much bigger and includes two normal hotels and two special ones: the HostelArium with cheaper rooms (with partial self room service and common bathroom facilities), and the CapsulArium with even cheaper capsule space for quiet night sleep. Clients can thus rent rooms of various types, by the hour or by the night. These go from normal hotel rooms (standard to luxury) to small public dormitories called DormitArium, for groups of 5 to 25 people, not to mention again the individual capsule rooms for the cheapest possible overnight stay. These accommodation facilities are surrounded by a more complete CafetArium area than the one at the ApolafsArium, with first-class restaurants, cafeterias, a beautiful open-sky coffee-bar all around an apposite pool with a direct view on the sea, and an adjacent closed tea-room. Contrary to the ApolafsArium, no booking is required for entrance in this case. Anyone can come in freely to enjoy even things as simple as a single cup of coffee, or a piece of cake, in the coffee-shops, or on the many terraces in front of the sea, in the shade or in the sun, or rent a long chair on the beach and swim at will. At their choice, and in addition to what the formal ApolafsArium can offer, they can also enjoy practicing the many sports of the big ArenArium, like tennis, squash, basket, jogging, including practically unlimited pool and beach or sea sports. The DiaskedArium even includes a CinemArium with many size projection rooms, and even an open-sky room, for evening shows, with good weather and with comfortable seats equipped with individual small tables to order food to be consumed during the film projections. It has at its side a MusicArium but, this time, reserved for disco music during late evenings, and light classical music during the day time. The DiaskedArium includes a PlanetArium for star observation in various ways, and an accompanying MeditArium for meditation, in complete isolation or in company, with some rooms with an open-sky deck for night stars admiration while meditating. PythAcademia - The PythAcademia is the short name of the University proper or, as per its full name, the EthoPlasìn Academy. Its students live in a reserved area called globally the ARIUM, with strict hours and a severe internal discipline, sleeping in dormitories, with no visits being allowed, in or out, from Monday to Friday: the AndrArium for males and the GynecArium for females. They thus receive modern Arium Education, essentially on a "Socratic Dialogue" basis, as opposed to traditional Classroom Education. To their normal curriculum of study, in exchange for their full scholarships, they must freely and willingly integrate the elements of a very special discipline meant to educate them as better human beings, better citizens and better inhabitants of Planet Earth, as opposed to only as knowledgeable professionals, like all other modern universities do today worldwide. Students must also give some hours (about 8 hours per week) to help grow their own vegetarian food and take care of the animals of the campus and the persons victims of civic violence hosted in the CivicArium. The PythAcademia itself issues normal and full university degrees in loco, albeit in a limited number of subject matters (see our page on EthoPlasìn Faculties). However, it can also issue university degrees in just about any other subject matter, in collaboration with other universities with which it has developed bilateral agreements, maintaining its students under scholarship at these other universities. For some of these degrees it also works from the campus, but online and in close touch with the faculties of these foreign universities, combining local and telematics facilities into a holistic formation process. As mentioned above, the special EthoPlasìn educational discipline is a mandatory requirement in addition to the regular students' curriculum of study and is strongly rooted in the Philosophical Exercises of Ancient Greece Philosophy. An EthoPlasìn Graduate is thus a fully qualified professional, with a normal and full university degree, but with the additional perk of Civitas Qualifications, in having also received a holistic education (or: ELLducation), as a person, as a citizen, and as a responsible Planet Oneness Inhabitant. PythAssociation - The PythAssociation is the membership association that trains non-student members at distance in the same EthoPlasìn discipline. These members are not university students at the Arium and they only concern themselves with the special educational discipline and Civitas Qualifications provided by the Academy. They get their EthoPlasìn formation while studying or working normally in their own countries. They also enjoy some privileges when visiting the PythagorArium. PythInstitute - This is the ThinkTank of researchers on the Pythagorean Way of Life and the philosophy of Ancient-Greece as a Science of Being. Every year the PythagorArium brings in the best experts it can find in the world for this purpose. Their research is guided by the LogosArium and their findings form a potential base for the formation of all the teachers and trainers at the ARIUM. These external experts however do not have the final say in training and formation issues: the LogosArium does. Their findings can be used as such, or re-elaborated by the LogosArium who has the final say. LogosArium - The LogosArium is the final authority in providing the ideas and the training material for EthoPlasìn formation. 'Logos' can mean various nuances of things like: word, law, rule or concept. The LogosArium is the special center of study and activity for the recovery and the propagation of the best of the "Know Thyself" culture of Ancient-Greece, to make sure the EthoPlasìn has the best knowledge and tools it needs to pursue its important mission of best Civitas Management. In other words, the LogosArium provides the thinking, the leading EthoPlasìn concepts and elements of discipline, for the Academy students and its Membership around the world, in terms of philosophy, science of being, discipline and World Civic Wellness. The LogosArium has a limited permanent staff at HQ, but is fully assisted by the PythInstitute ThinkTank mentioned above. You can also visit our EthoPlasìn page on the LogosArium. 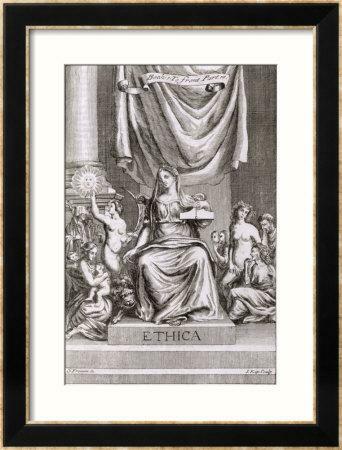 Salon de Philosophie': lesson of Ethics (Engraving by G. Freman). ElinArium - From 'Ellin', that has the meaning of 'Hellenic', or 'Greek'. The ElinArium is a 'Salon de Philosophie' taking care of public relations, general decorum rules, official events like the annual Graduation Ceremonies, presentations and shows of various kinds. The Salon de Philosophie also offers a sophisticated variety of ongoing cultural and social activities to promote the EthoPlasìn culture and objectives, along with Meritocracy in the short term and EthoCracy in the long term. As a direct consequence of this role, the ElinArium also promotes the spreading of the Hellenic culture of Ancient-Greece, in modern Greece itself and worldwide. Finally, one of its important functions is to make the appropriate selection, and to assign two yearly World Prizes, of EthoCratic values and Pythagorean life recognition. The first one is the PytHarmony World Prize, assigning 3 medals to the 3 members of the worldwide EthoPlasìn Association who have most contributed, during the past year, to the spreading of the EthoPlasìn values and/or to the progress of the advent of EthoCracy. The second World Prize is the WACEM (World Award for Civic Education Medal), to be assigned to three persons who are usually complete outsiders (not EthoPlasìn Association members), as described in the ACE section of our page on EthoCracy. WACEM is the public external name of this world prize. Internally, if a WACEM prize goes to a member, it is called the PythACEM World Prize (Pythagorean Award for Civic Education Medal). The two series of candidates, for both PytHarmony and PythACEM world prizes, are ranked by the ElinArium and the 3 best ones receive a Gold, Silver or Bronze medal, like in the Olympic games, but yearly, and with a scholarship or a money prize attached. AmilArium - Students must also receive full physical education and integrate intensive sport activities in an AmilArium set up with full Olympic Sports Facilities. 'Amilla', as the root of AmilArium, means 'Emulation' ("άμιλλας"), which is better than the word 'competition' in describing the real spirit of the Olympics contests of Ancient-Greece. An Olympic contest was often described as a "Polite Emulation", as a gentile process of emulation of the best ones, their friends and idols, as opposed to an anonymous competition. When students 'fight' between themselves, like when practicing EthoJudo, they do so in a reserved area of the AmilArium called the AgonArium, as 'Agonas' ("αγωνας") has the real meaning of hard competition. The three main student buildings (the AmilArium, the AndrArium and the GynecArium) all have the hexagonal shape of a honey comb on the Campus map, as a symbol of strength. Students must also appear and perform 'publicly' in the AmilArium in relation to their study of a music instrument, and in group exercises related to the mastering of EthoPlay, civic education, meritocracy and better interpersonal communications through EthoSpeak (with Katharevousa and the international auxiliary language called: EthoGloso). See the Attachments section below for an outline of the Campus and of the typical daily ARIUM schedule. CivicArium - The EthoPlasìn also provides social assistance and related social recuperation to complete outsiders who are neither students nor members of the ARIUM. In fact the ARIUM includes a CivicArium with symbols and live elements of all kingdoms: mineral, vegetal, animal and even human. It includes for example a mini "Social Recuperation Center" for persons and animals victims of civic violence. It has many gardens with plants and animals of various species in its BiosArium that includes a barn, a stable, a mini-botanical area and a hive. Animals can move freely between all gardens of the campus through a set of passageways and underground tunnels; Animals can even be used as good company at any building on the campus on request, including hotel rooms and entertainment areas on the public side. The BiosArium also serves a vital function: the growing of all the vegetarian food of the campus. Students are expected to collaborate to this important function a few hours every week, and to make the campus self-sufficient for all its basic food grown in a perfect biological way. ErgosArium - The ErgosArium provides orientation and ultimately helps find employment for the students of the PythAcademia. As such, from an orientation point of view, it is conceived as an important educational component. 'Ergo' ("έργο") means 'work'. The ErgosArium ultimately helps students to find work at the end of their studies and disciplinary formation. In the meantime, it helps students to choose the best university faculties and specializations for their aptitudes, and the best centers of study when they cannot achieve their university formation objectives at the Arium itself. The ErgosArium also handles the selective Admission process at the Academy. Considering the top-quality facilities offered at the EthoPlasìn campus, all free, only on full scholarship, and considering also the most sophisticated and holistic formation provided, a strict selection process was put into place to face the inevitably very high demand for admission. Students can visit the EthoPlasìn page on the ErgosArium for more information. PythagorArium - The PythagorArium is the overall Campus container of all components, but more from a spiritual or cultural point of view. Overall it includes everything, as a unified "Being", somewhat like a "Human Being", but more like a "Philo-Social Being". As such it includes even the physical premises. It is the central umbrella organizational body. Its full official name is the Pythagorean World Center. The campus is divided in two physical parts, side by side. It has a Studying Side (PythAcademia) closed to the public, where students and members get their education, (or: ELLducation), free of charge, on full scholarship, and an internal Recreational Side (the ApolafsArium) with a formal environment open to the public, with top-quality facilities and activities for sophisticated entertainment purposes. This internal recreational side is matched by an external Amusement Center with an informal environment (DiaskedArium), a few kilometers south of the campus. All components of the PythagorArium are administered centrally through sophisticated services in a building called the ATRIUM. 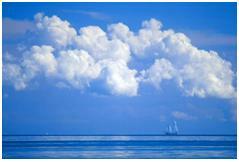 All facilities have a beautiful view and direct access to the Mediterranean sea. The PythagorArium is ruled on the basis of a Constitution and is presided by the currently elected Grand Master in collaboration with the other Master members of the campus. Go to the Attachments section below to see a physical outline of the Campus that includes the central Atrium and all the other components. 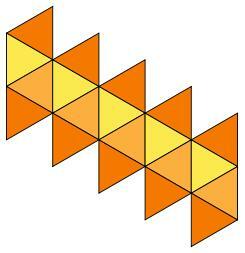 EthicArium - This is a subdivision of the PythagorArium. This is the container of only, but all the intellectual components of the PythagorArium, as opposed to the physical ones, which are part of the EdenArium, for example the ElinArium and the LogosArium. EdenArium - This is another subdivision of the PythagorArium. This is the container that includes the land and the buildings. As for the land on which the PythagorArium is built, it is a completely reserved area, with entirely biological organic gardening. The area is also totally self-sufficient in terms of electricity and fresh water, with plants and animals living without chemicals, on a surface infiltrated with Diatomaceous Earth. The area represents the closest possible form of a self-sustainable area, as a "Back To Eden" area, of the kind that can only be maintained by agricultural technology of the type developed by geniuses like Paul Gautschi. As such, this reserved and isolated island-like area of Eden-like agriculture is called: EdenArium. The donut Torus shape to the right represents the beautiful self-energy of the overall spiritual PythagorArium and physical EdenArium combined, as the harmonious integration of a perfect Tetractys. In that Tetractys, the body is the EdenArium. The soul is the ElinArium. The spirit is the LogosArium. The wisdom is the PythagorArium spreading around the world the EthoPlasìn education (or: ELLducation), defined in this website, and the philosophy of best civic governance as defined in its webpage on EthoCracy. The VE (Vector Equilibrium) shape it embraces (better represented on its own, further down), is the only geometrical form where all forces are equal and balanced. The energy lines (Vectors) are of equal length and strength and its figures are symbols of the law of "magnetic" attraction and repulsion. Overall it is a geometrical symbol of absolute balance, like the overall components of the PythagorArium and the EdenArium, attracting the absolute value of Good, and consequently repulsing its opposite, the Bad, as defined by the philosophy of Plato. The series of all the special names mentioned above, along with all the new words coined by EthoPlasìn and used in various pages of this website, appear in an electronic dictionary online, called the EthoPlasìn Dictionary. Here are some other important ARIUM names not appearing in the description of the above components. ManagerArium - This is the short name of the Directing Consortium of the PythagorArium. It includes the 12 Masters of the first 12 PythagorArium components mentioned above. It is not a separate body as such, but a regular meeting of all the Masters of the 12 voting components of the Arium. The ManagerArium meets briefly everyday at 18:00 for resolving all the current problems of the ARIUM. MasterArium - The MasterArium is the assembly of all the living ex Masters and ex Grand Masters of the Arium, living at or outside the ARIUM. They act as an experienced consultative body for the current Grand Master. It is not a separate body as such, but rather a meeting of the most experienced senior officials of the PythagorArium held for consultation and guidance purposes when required. DidaskalArium - This is the corps of teachers and trainers formed and living, or operating occasionally, on the campus. It is not a separate body as such, but a meeting of all the teaching and training people present at the ARIUM at any given time. 'Didaskalos' ("Διδάσκαλος") means a 'Teaching Master'. KallosArium - This is the main representational building of the ARIUM. It is basically the HQ of the current Grand Master and its team of closest assistants. It also includes the ElinArium, the LogosArium and the PorcelainArium. 'Kallos' ("κάλλος") means 'Beauty of both Body and Soul harmoniously enmeshed together'. PorcelainArium - This is a small museum as a special area of exposition of fine porcelain art work. It exposes exclusively entirely hand-painted pieces produced on the basis of the best classical tradition of painting on fine white Porcelain. The base of this small museum is the collection of artist Vassiliki, a world expert painter on porcelain, and concurrently the head of the ElinArium 'Salon de Philosophie', as most of her pieces have been inspired by the philosophy of Ancient-Greece. AlogArium - This is the special horse riding place of the BiosArium. 'Alogo' ("Άλογο") means 'Horse'. The horse is the main symbol of the ARIUM from the animal kingdom. Students have a special relationship with horses. They care for them and use them for both sport and rides of pleasure on the grounds and the beach of the PythagorArium. PythArium - A first abbreviation of the "Pythagorean World Center" is "PythagorArium". A further abbreviation of the latter, as a nickname for daily current oral business convenience, is PythArium. In turn, the full official long name is often abbreviated as PAWCEN (standing for: PythagorArium World CENter). PreEdenArium - The mainland hosting and screening area that includes the DiaskedArium and controls access to the EdenArium of the PythagorArium. EdenArium - The offshore ecological and bio-diatomaceous land on which the main core of the PythagorArium is built and where its students are formed. N.B. - When requested, EthoPlasìn HQ will be willing to provide guidance to all empathizing schools wherever they are. The Academy is also willing to become a Central EthoPlasìn Controlling Institute, at world level, for all the schools who will freely request the negotiation of a formal association agreement with the ARIUM. Such an affiliated school becomes an EthoSchool. For a very short summary of the meaning and the content of this website, please see the SUMMARY page under the relevant button, at the top right corner of this page. For a more substantial overview of what EthoPlasìn is, reading the above presentation of this Home Page should be sufficient. The website however includes a lot more information. This additional information, for those who may be interested, is presented in the tree-structure of dependent pages here below. > Jacques Drapeau, appearing in the picture to the left, is the founder of the PythagorArium. As such, he is the temporary acting director of three fundamental components: the PythAcademia (the EthoPlasìn Academy, as the International University), the BeLovArium (the Foundation and main financial authority) and the LogosArium (the philosophical conceptual body). A Grand Master for the overall PythagorArium will be elected and appointed officially as soon as it gets to be fully operational. On the basis of the EthoPlasìn constitution, the Grand Master will then nominate and appoint the Masters of the 12 PythagorArium components who will form the ManagerArium (the Directing Consortium). The ManagerArium will vote at majority on each decision, with the Grand Master coming in with a decisive vote when necessary, in case of a tie, and also, at his discretion after consultation of the MasterArium, with a right of veto on any of the decisions taken, even retroactively if a decision was taken without his presence. 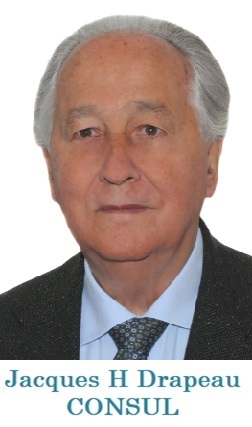 Jacques is retired in Italy, as an ex Canadian career diplomat (thus his choice of retaining legitimately one of his diplomatic titles, the minor one, for convenience purposes, as Consul, because it is probably the oldest and most universally known such title to the general grand public, and also the title by which he is still called by most of his contacts and acquaintances). Jacques graduated as a lawyer at the University of Ottawa. His experience of the world, and of human behavior, is extensive, as he got to know well over 100 countries, and he lived and worked for years on all continents except Oceania. He speaks 7 languages, 5 of which fully fluently and is an educated pianist as a hobby. Jacques' wife, Vassiliki, is a graduate psychologist and a long-last adept of philosophy and, as an artist, she is also a world expert painter on fine porcelain. As a kind of background co-founder of EthoPlasìn, she is the first-choice candidate to become the director of the 4th fundamental component, the ElinArium (the 'Salon de Philosophie' in charge of decorum and public relations) and the curator of the PorcelainArium that, for the most part, will include the production of her own collection. Jacques and Vassiliki have three university graduate children living in England, Canada and Italy. At retirement, Jacques established his main family residence in Rome, Italy, but because of this project (suspended temporarily at the moment because of the Greek economic crisis preventing the project to have chances to become self-financing) they regularly spend a lot of their time in Greece, which has been elected as the best physical and logical location for the Academy, on the seaside, few kilometers south of Athens. The EthoPlasìn conception started as an idealistic fantasy, but this virtual project has the potential to soon become full reality, after the worst of the economic crisis in Greece will be over. At this time, the concept is well defined, the core land for the Campus is available and many of its collaborators have been identified and committed to the project. As shown in some of the attachments that follow, the campus outline has also been designed and its final configuration firmly established. Only the commitments for the initial financing of the project, in building its premises, need to be completed for its full launching. Once it will be fully operational however, the Academy is well planned to be completely self-financing through an accurate exploitation of the commercial operations of the two areas of the campus that are open to the public (the formal ApolafsArium and the casual DiaskedArium) with all sorts of top-quality entertainment facilities for touristic, sportive, cultural, recreational and social activities, directly on the Mediterranean seaside. A free horse to the right, running on the seaside of the campus, as one of the EthoPlasìn symbols from the Animal Kingdom. Lavender field down to the right. Blue Lavender is one of the symbols of the EthoPlasìn from the Vegetal Kingdom. Fire in a heart form, further down to the right, as a symbol of the "Hot Issues" dear to members' heart. 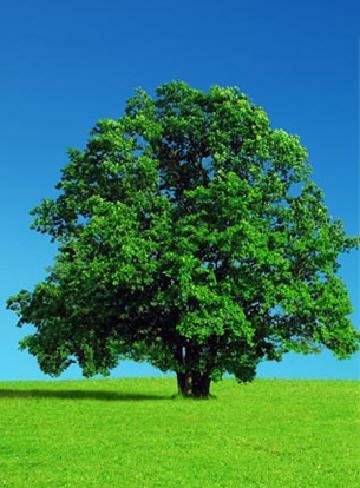 A beautiful tree to be hugged with love, gratitude and a feeling of cosmic planet oneness, up to the right. Three Lantana flowers further up to the right as another EthoPlasìn symbol among many others. All the symbols of the EthoPlasìn are specified and explained in our page on Ways and Symbols. Samples of the Sacred Geometry of Pythagoras and Plato in the Notes area at the end of the page. Many new terms are coined in this website. You should be able to find a definition of most of them in the EthoPlasìn Dictionary. "EthoPlasìn" is coined here as a brand new word that comes from the loose combination of two Ancient Gr eek words: Ethos ('Ήθος', intended here in its philosophical extension of 'Ethics') and Plasì ('Πλασις', taken as 'formation', as in 'Διά-πλασις'). "Plasin" has also a connotation of 'plasma', in terms of a shapeable substance, or substance giving form: 'Formation'. "Ethos" has a broader meaning extension than "Ethics". It also means a set of beliefs and ideals that form the 'most valuable traits of character' of a person, a community, an association or a nation. This new word in our context is intended to mean basically: "Formation to Ethics" but also, by free extension, "Educational Formation to World Civic Wellness" intended in its Pythagorean way. In coining the word EthoPlasìn, we, by the same token, coin two more new related words: "EthoCracy", as a new form of DemoCracy, where the "EthoPlasìn Philosophical Discipline" becomes the seed and philosophical enlightenment capable of generating a superior type of MeritoCracy, meant to become an EthoCracy, not to mention a new world to come, and to long for, from a World Civic Wellness point of view, wishfully and candidly called "EthoLandia". The EthoPlasìn Academy, or the PythAcademia, is only the university part of the global compound called Pythagorean World Center. As seen above, the Center includes 12 components. PythAcademia, is the official short international name of the Academy, given in honor of Pythagoras and Plato. It comes from the combination of the prefix 'Pyth' of Pythagoras with the word 'Academia', which was the name of the later school of Plato. The Academia School of Plato followed the Hemicycle ("Omakoio") School of Pythagoras by some 150 years, but is much more well known in our western culture. However, Plato's Academia was of clear Pythagorean descent and conception. It is the main line of thinking of these two greatest philosophers of Ancient-Greece, Pythagoras and Plato, that the PythAcademia tries to emulate in what is often called the formation of the "Pythagorean Man" as opposed to the modern "Faustian Man". PythAssociation: with the same logic that formed the name of the Academy (PythAcademia), the name of the EthoPlasìn Association is PythAssociation. ΕΠΑ, with the Greek "Π", are the official initials of the EthoPlasìn Academy. ΕΠΑcademia is thus the short internal name of the EthoPlasìn Academy, with the typical Greek "P" to often serve, in its list of symbols, as an image of the grand door of entry into the decorous life-style it promotes. ΕΠΑssociation is thus the short internal name of the EthoPlasìn Association. PhiloEcoSophy (and thus also PhiloEcoSophical) is a new word being coined. Like 'Philosophy' means 'love of wisdom', 'PhiloEcoSophical' means 'loving wisdom for ecological initiatives and purposes'. Contrary to the drastic 'green ecological' movements, that are usually highly politicized, the philoecosophical movement is not a "green" political movement, but rather a 'blue love' movement for our beautiful blue Earth: love for beneficial ecological initiatives of good common sense that shall benefit both citizens and the planet as a whole. BeLovArium was the name at the origin of the present EthoPlasìn website, the name by which the project was first known, but it is really only the Foundation providing the initial and long-term real-estate financing of the overall PythagorArium (with its 12 components, as described in a previous section). Civitas has the meaning of good city life, or level of 'Civilization', intended by extension as harmonious civil life or civic environment. SUMMARY - This EthoPlasìn website contains a lot of information but for a brief overview of what EthoPlasìn is, reading the first paragraph of the Mission Statement, and maybe the rest of this short opening page, should be sufficient. In any case, there is a "Summary" page of the overall project under the button of the same name at the top right corner of this home page. However you also have links to many other pages with more information on various aspects of the Academy: its Discipline, its Educational Philosophy, its Science Of Being, its Components and its Facilities. The best way to read these extra pages is following the descending structure of their presentation if the tree-structure above. There is also a series of PDF attachments mentioned just above. 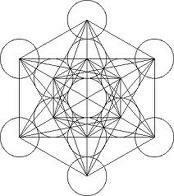 Medieval Italian mathematician Fibonacci discovered the special geometrical figure that he named the "Metatron Cube" (called in honor of archangel Metatron, with a good 2D drawing representation in the second figure of the previous Notes section, up to the right). 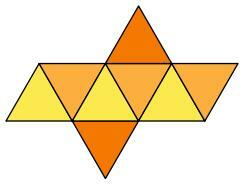 This "Cube" integrates tightly all Five Perfect Platonic Solids in one single geometrical figure, as shown below. Fibonacci was really called Leonardo Pisano and lived in Pisa between 1170 and 1240. He was in great part responsible for the rebirth of mathematics and geometry after a long period of decadence between the end of the Greek Classical Period and the early Middle Ages. He is more well known for his discovery of the so-called Fibonacci Numbers (or Fibonacci Sequence: 0, 1, 1, 2, 3, 5, 8, 13, 21, 34, 55, 89 ... etc., where each new number is the sum of the two previous ones) that, in the relation of each sequential two, progressively get closer and closer to the famous proportion called the "Golden Ratio" (or: 1.61803..., with an infinite number of decimals without any repeating pattern) at the base of the Beauty attribute of all naturally created things. This Golden Ratio, and its relation to Beauty, have been at the heart of the Sacred Geometry since its Pythagorean inception, and they are now eminently part of the EthoPlasìn concept of Kallos Beauty. 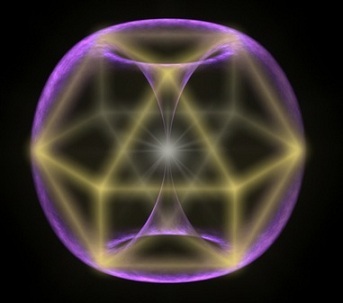 Sacred Geometry has been used in Ancient-Greece as an introduction to the most advanced level of philosophy, called Metaphysics. Its sister subject was Music. Mathematics, Music, Geometry and Cosmology were the 4 great Liberal Arts of the Ancient Greek World. All where at the base of the Pythagorean Formation 2500 years ago, and this is still the case today with the EthoPlasìn Academy. They express a universal language founding the understanding of all the beauty and harmony of the Universe, in all aspects of its reality, human, physical or otherwise. These ancient arts, or sciences, are thus also eminently at the base of the formation of the Pythagorean Man at the EthoPlasìn Academy today. Their fundamental formation value is universal and immutable, independently of space-time.